In my last post I wrote about making it easier to copy IBM i files to an IFS folder. I have my personal IFS folder set up as a Microsoft Windows network drive, which allows me to open the mapped folder in Windows Explorer, and just drag-n-drop files from the mapped network drive into folders on my PC. Here I am going to describe how you can do the same. I am going to use Client Access's Operations Navigator, I could use IBM Navigator for i instead, but I have found that not many sites have not enabled it. To be able to do what I am describing you are going to need the full version of Operation Navigator, and the appropriate authority to create folders and shares in the IBM i partition you use. If you do not have the full version of Operations Navigator and/or you do not have the necessary authorities feel free to share this with your System Operation or Tech Support person who can perform these steps for you. When I open Operations Navigator I see of all the IBM i I connect to. I can only use the folder on the same IBM i I want to copy files from. 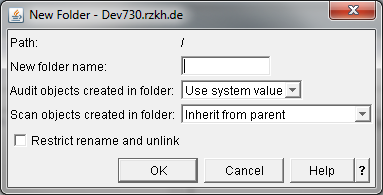 In this case I will be creating a new folder on the IBM i partition DEV730. 1. I click on the plus symbol ( + ) next to the IBM i partition I want to create the folder on. 2. I click on the plus symbol next to "File Systems". 3. I click on the plus symbol next to "Integrated File System". 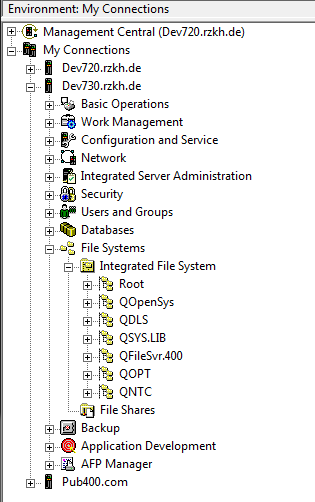 Note: If you do not see the "File Systems" and the "Integrated File System" then you do not have the full version of the Operations Navigator. 4. Right click on "Root". 6. I enter the name of the folder I want to create. Beware: The IFS is case sensitive so RPGPGM <> RpgPgm <> rpgpgm. Leave the other choices as they are. Click "OK" and the folder will be created. In the previous image some of the folders have an arm in a blue sleeve under the folder image, this means that the folder can be shared. You can share any folder, including the one I just created. 1. I right click on the folder I just created. 3. Click on "Create Share..."
4. I give the share name the folder will be known by, when it shared. And change the "Access" to be both Read and Write. This way I can copy data to the folder. Click "OK". The folder will then have the arm under it to indicate that it can be shared. I only attach to a Microsoft Windows network drive from my PC when I need to access it. It is possible to map drives that I can connect to when my PC starts, but I have found that it increases the length of time my PC takes to start. Therefore I have a number of DOS compatible Batch files that perform the mapping and connection for me. If I need to attach to the network drive I configured for my Windows shared drive I just run the Batch file for it. NET USE R: instructs Windows to use the drive letter R for my folder. 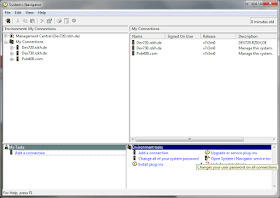 \\<IBM i name>\RPGPGM is the path name to the share name I created. You'll have to experiment to see which works best for your IBM i environment. I add a pause statement so that I need to press Enter at the end of the Batch file's processing. This allows me to see any error messages, or that I connected successfully. I call these batch files connect_ then the drive letter. In this case the file would be called: connect_R.bat, and I would place it on my Windows desktop. The password is invalid for \\dev730.rzke.de\RPGPGM. I enter my IBM i password, and press Enter. If I look in Windows Explorer under "Computer" I can see the mapped drive. If you are receiving an error when using the NET USE double check the path name to the share is correct. If that is correct the error could be caused by your IFS user profile becoming disabled. Ask your System Operator or Tech Support person to check the status of your profile for using IFS. In the next post I will describe how you can find out whether your IFS user profile is disabled and how to enable it.